George Orwell’s estate is watching you—at least if you try and use the number ‘1984’. In an ironic turn of events, the Orwell estate has recently issued a copyright takedown to prevent the use of the four digits without permission, reports Torrent Freak. 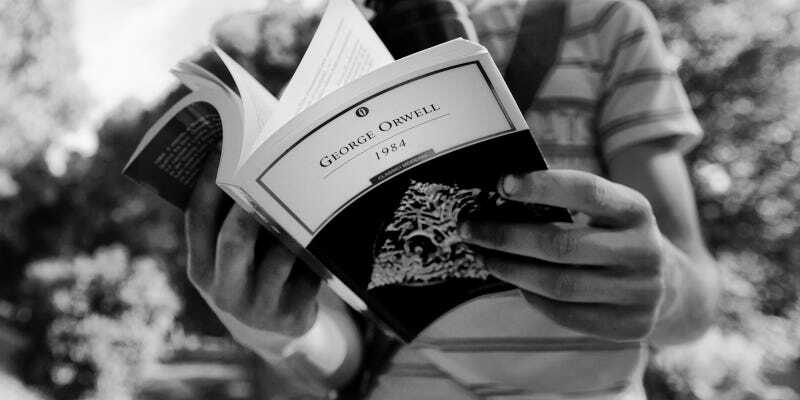 While George Orwell died back in 1950, his dystopian masterpiece that is the novel 1984 lives on. The number has become iconic, a shorthand that connotes the surveillance state and strict authoritarian control. Some time back, Internet radio host Josh Hadley created a T-shirt design on CafePress that featured the number. Now, though, he’s received a message from CafePress telling him that the designs have been taken offline. The reason? The Orwell estate claims that they contain“George Orwell quotes”— though the only reference appears to be the numbers that make up the title, as you can see in the screenshot provided to Torrent Freak by Hadley, below. Hadley, for his part, plans to reissue the T-shirt through a store he’s since set up as part of his online radio show. Incidentally, first time round he never actually sold any of the T-shirts, according to Torrent Freak, though that’s not really the point. Perhaps more the point is that Orwell’s estate is doing a wonderful job of living up to the author’s worrisome future-gazing. Image by Luca Cerabona under Creative Commons license.